Slowly, but surely, I’m updating with recipes for things I’ve posted about in the past. Today is all about Homemade Pizza [click here to see my recipe for homemade pizza dough from scratch]. I’ve yet to experiment with making my own marinara sauce at home, mainly because the store-bought one I use? I love the taste of it. I take a few pieces of boneless chicken cubes (you don’t need that many unless you prefer it to be full of a lot of chicken) and cut them each into very tiny pieces. I added salt and some grilling seasoning (I used Dash’s) to the chicken, along with a little bit of oil and cooked it through on low to medium heat. The chicken cooks really quickly because it’s not a lot of chicken and it’s cut into such tiny pieces. Tip: Use salt-free seasonings so YOU can control the amount of salt. Then use either a homemade pizza dough or one you bought [which I do plenty of times]. Roll out your pizza dough to fit your pizza pan. Pour and spread marinara sauce (you can use pizza sauce, tomato/pasta sauce or whatever you prefer… I find marinara sauce to work best) all over the dough. Then, I sprinkle mozzarella cheese and parmesan cheese on top. Next, I sprinkle oregano and parsley flakes over the cheese. Finally, add the chicken (evenly spaced out). I baked this pizza for 25 minutes in a preheated oven at 350 degrees. Again, either make a pizza dough or buy one. Roll out your pizza dough to fit your pizza pan. Pour and spread marinara sauce all over the dough. I, then, sprinkled a pizza cheese blend all over on top of the marinara sauce. Next, I added oregano and parsley flakes again on top. I baked this one for 25 minutes on 350 degrees as well. I made this one yesterday. Again, either make a pizza dough or buy one [For this one, I used Betty Crocker’s Pizza Crust mix and was surprised how nicely it turned out]. Roll out your pizza dough to fit your pizza pan. Pour and spread marinara sauce all over the dough. I, then, sprinkled a pizza cheese blend all over on top of the marinara sauce. Next, I add in shredded chicken tikka pieces [see below for how I make it]. Sprinkle varying colors of peppers on top. Finally, I added some Italian seasoning. I baked this one for about 20 minutes on 400 degrees. For the chicken tikka: I had marinated chicken with black pepper, garlic powder, paprika, yogurt, lemon juice, and tandoori masala a day or two ago to BBQ. It had rained, however, so I’ve been using said chicken in various forms this week. I, then, cooked it over low heat. I typically use boneless chicken but the one in the picture above – I used leg and thigh pieces. Seasonings, spices, toppings, etc. can be altered to using your own preference… I just usually make it up as I go along based on what flavors I wanted and what my family likes. Note: How long the pizza(s) take to bake in the oven will depend on your oven, how thick your crust is, etc… so keep an eye on it. Greeting from weekend potluck. 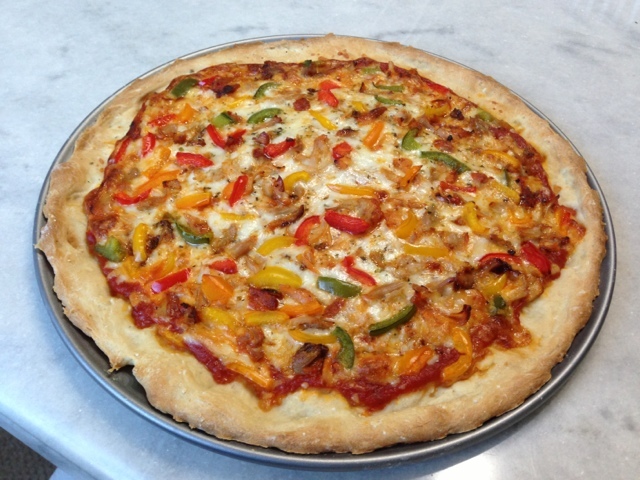 Nothing beats homemade pizza – and I love the endless combo of things you can put on. Thank you! I agree with you — anything homemade for that matter! Lucy – thanks! Your stromboli sounds delicious! I&#39;ve been thinking of making one myself lately.<br /><br />Pizza dough is hard, I agree. I hated making my own dough, but this recipe seems to be a no-fail one for me. A store bought dough will work just as well though (I use one often myself).